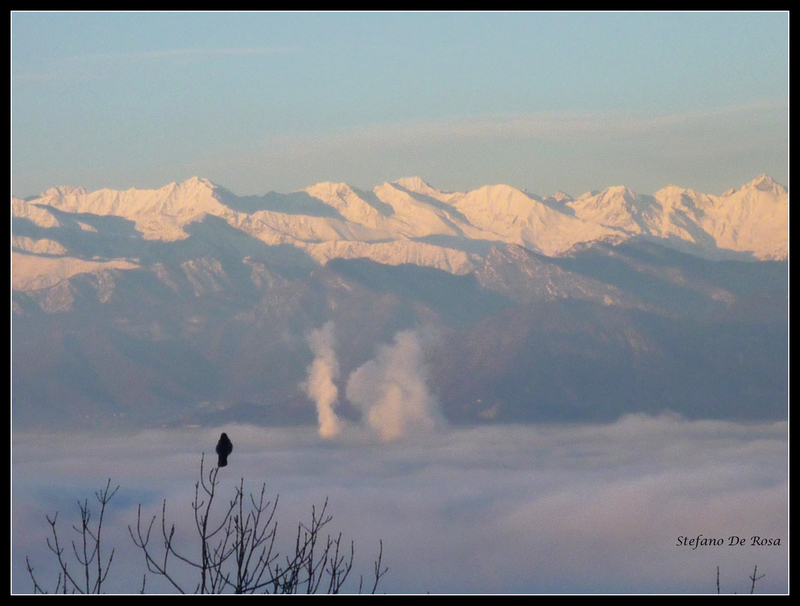 At left (9:30 on the hands of a clock) stands Monte Viso, the highest peak of the Cottian Alps (12,602 ft or 3,841 m). On the opposite side of the panorama is Rochemelon (11,608 ft or 3,538 m) in the Graian Alps. At the “south pole” is Levanna Orientale (11,663 ft or 3,555 m). Just below the “north pole” of the panorama, resembling the geysers on Enceladus, are plumes of smoke from industrial plants rising through the curtain of fog. Note the perching bird admiring the “world” from its privileged position atop the tree. The object at bottom left center is a light pole. Photo and technical details: Seven images taken with a DMC-FX35 Lumix Panasonic digital camera and combined with Panorama Maker 4. Little planet panorama obtained using Photoshop CS4. Click here for a zoomable version of the image.